One of the most prominent Star Trek writer/producers thinks that the forward-looking series missed its mark by never portraying homosexual characters as part of daily life in the future. It's really difficult to imagine just how socially groundbreaking Star Trek was when the original series first aired in 1966. The primary cast included a black character (a black woman, no less) during the days of the civil rights movement, and she was soon joined by a Russian - which was quite forward-looking indeed during the days of the Cold War. The franchise has tackled issues like racism, gender equality and the like - but one thing it never dealt with was homosexuality. In 1991, series creator Gene Roddenberry told The Advocate that the next season of The Next Generation would feature gay characters as part of everyday life on the Enterprise-D, but his death meant that those promises never materialized. Speaking with AfterElton, Brannon Braga - one of the franchise's most high-profile writers and producers - said that the failure of Star Trek to tackle homosexuality was something that he and his coworkers regretted. "It was a shame for a lot of us that ... I'm talking about the Next Generation, Deep Space Nine and there was a constant back and forth about well how do we portray the spectrum of sexuality," said Braga. "There were people who felt very strongly that we should be showing casually, you know, just two guys together in the background in [the Enterprise's cafe] Ten Forward." In the end, the creative team opted not to do it (obviously), which Braga attributes to it being a different day and age before Will and Grace and Queer Eye. "I think those same people would make a different decision now ... It was not a forward thinking decision." That said, Braga isn't quite sure if a gay character would fit well in a new Star Trek movie as opposed to a multi-season TV series. "With a TV series you're creating a whole world, you're creating a whole. You were saying, if this is going to last for five years, and if you don't go there, then yes you got some questions. A two-hour movie and you're sitting there and you're eating your popcorn, if doesn't fit ... if it's not part of the story, it's not part of the story." Star Trek fans will note that any time the series did approach the issue - Riker falling for an alien with no gender, or the wonkiness with Trill symbiote hosts of different genders - it was pretty much a cop-out. It's also worth noting that where Brannon Braga believes the series missed its mark, fandom (and the internet) picked up the slack. 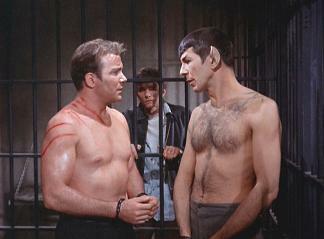 Slash fanfiction pretty much started with Kirk/Spock, and it's only gotten more prolific from there. Gene Roddenberry never did get a homosexual couple on the screen, but without him we might not have legions of Kingdom Hearts fans writing heartfelt romance between Sora and Riku, right?